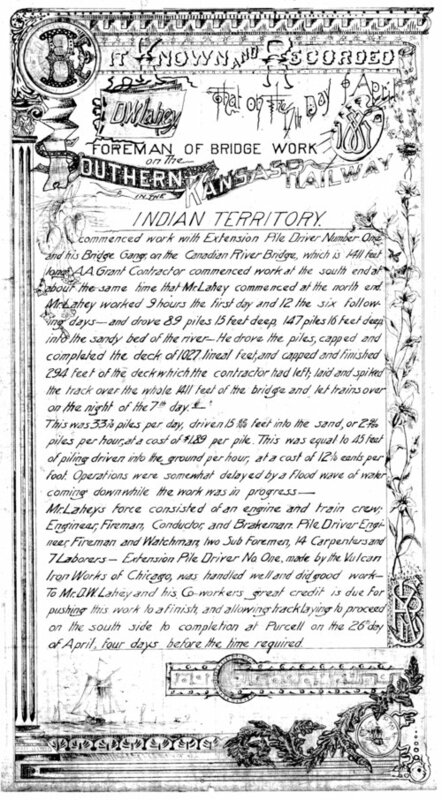 This is a commendation letter for the bridge foreman and his crew to complete the Southern Kansas Railway, which became the Atchison, Topeka & Santa Fe Railway, bridge over the South Canadian River south of present-day Oklahoma City four days before the appointed time. The Gulf, Colorado and Santa Fe Railroad had built north from Ft. Worth, Texas, and also completed the line to Purcell on April 26, 1887. At the time, this was in Indian Territory. Apparently the lines had to be completed by April 30.